On a beautiful day at Pierce High School, Boone Central qualified 15 athletes in 16 events for the Nebraska State Track & Field Championships to be held Friday and Saturday, May 22-23, at Omaha Burke Stadium. That represents a considerable leap from 2008 when Boone Central had just three representatives in Omaha. While amassing its qualifier list, the Lady Cardinals placed third in the B-4 team standings behind champion Columbus Scotus and host Pierce. Lacking that team depth, the BC boys still finished a solid fifth in the 11-team event. “What a day!” exclaimed Boone Central Coach Kris Pestel. “It was a beautiful day, weather-wise, and a great meet for our kids! “From the throws to the jumps to the track, all of our kids gave their best efforts,” Pestel praised. 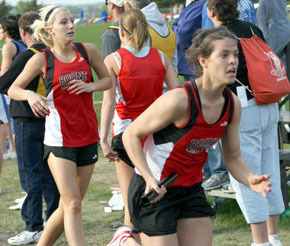 “We had several personal bests, a number of district places and a bunch of state qualifiers – 15 in 16 different events! Pestel was quick to note the leadership displayed by Boone Central’s upperclassmen in 2009. “We were led by our seniors. All of our seniors that competed in district qualified for the state meet,” she noted. “They have helped to keep the team focused on improving daily and giving our best efforts in meets. Joining Cardinal seniors Paige Kolm (p. vault, 1600), Chancee Nolan (4×400), Halie Smith (3200), Emily Wells (discus), Kevin Krohn (300H, 4×100) and Kalvin Zoucha (discus, 200, 4×100) in Omaha will be juniors Savannah Baker (l. jump, 4×100, 4×400), Megan Bygland (100H, 300H, 4×100), Alicia Getzfred (p. vault), Kevin Carder (3200), Dustin Christo (4×100) and Nathan Olson (300H, 4×100), sophomore Bobbi Beckwith (200, 400, 4×100, 4×400) and freshmen Jaime Kennedy (4×100) and Breann Thorberg (4×400). In all Thursday, Boone Central had one individual event champion crowned, one winning relay team and 25 placing efforts (15 girls, 10 boys). 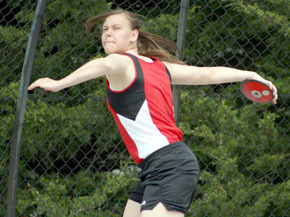 Boone Central’s 2009 district champion was senior Emily Wells, who captured discus gold with a throw of 112-5. Wells also scored in the shot put (5th, 33-10) and younger sister Sara Wells added a sixth-place in that event (33-4). Soph Bobbi Beckwith was again a stalwart performer for the BC girls at Pierce. Beckwith raced to a runner-up finish in the 400 meter dash (60.1), placed third in the 200 (25.7) and anchored the winning 4×400 relay and runner-up 4×100 relay, earning four state meet berths. Pole vault was another strong event for the Lady Cards with Paige Kolm placing second (8-4) and Alicia Getzfred fourth (8-0). Savannah Baker capped BC field event scoring with a second place in the long jump (16-½). She also added points with a sixth-pace run in the 100 dash (13.0). Megan Bygland will return to the state track meet in the hurdle events after taking second by a nose in the 300 lows (48.7) and placing third in the 100 highs (15.9). Halie Smith also makes a return trip to Omaha with a runner-up effort in Thursday’s 3200 meter run (12:47.9). Kolm finished fourth in the 1600 (5:52.4) to qualify in that event. The Cardinal girls were impressive in the relay events, as well. The 4×400 unit of Breann Thorberg, Baker, Chancee Nolan and Beckwith raced to a three-second victory (4:12.4) and the 4×100 team of Bygland, Baker, Jaime Kennedy and Beckwith was runner-up to Scotus (51.1). On the boys side, senior Kalvin Zoucha was the BC leader, qualifying for the state meet in three events. Zoucha was runner-up in the discus (146-6) and 200 meter dash (23.3) and brought home the second-place 4×100 relay (45.3). Other 4×100 team members were Dustin Christo, Kevin Krohn and Nathan Olson. The Cardinals notched a pair of state berths in the 300 meter intermediate hurdles with Krohn finishing third (42.9) and Olson fourth (43.0). Kevin Carder secured a spot in Omaha by placing fourth in the 3200 meter run (10:26.6). Carder just missed qualifying in the 1600, placing fifth (4:49.1), and the 4×400 relay squad of Olson, Keenan Howell, Zoucha and Krohn fell a position short, finishing third (3:36.9). Also scoring points for the BC boys Thursday were Howell in the pole vault (6th, 12-6) and the 4×800 meter relay team of Brody Kelley, Otto Pankrath, Jacob Lindgren and Tony Krohn (6th, 9:33.1). Complete Card Results at District in Print & Online Editions of Albion News.